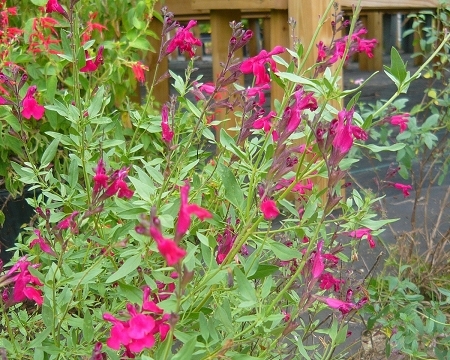 Raspberry Royale Salvia (s. greggii x lemmonii)- Easy to grow plant features elongated green leaves with a pleasant fruity scent and loads of bright raspberry pink flowers. Drought and heat tolerant once established. Will quickly form a small bush loaded with flowers blooming over a long period of time (summer til first frost) that will attract hummingbirds and butterflies to the garden. Perennial zones 8-10 Live plant in 3 inch container. I was ordering the Hot Lips Sage and decided to throw in two of these. They are beautiful. You won't be disappointed.